How Are Genes And Bone Fracture Risk Related? A large international collaboration of researchers identified 15 variations in the genome that are related to the risk of suffering bone fractures. 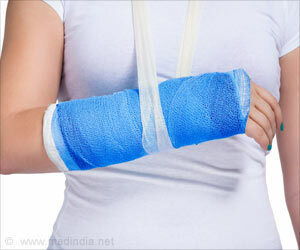 Bone fractures are a major healthcare problem affecting more than 9 million persons worldwide every year. The study provides evidence against a causal effect of several proposed clinical risk factors for fractures, including diabetes, rheumatoid arthritis, vitamin D, as well as others. These findings strongly suggest that treatments aimed at increasing bone strength are more likely to be successful in preventing fractures than widespread supplementation of calcium and vitamin D or targeting other risk factors that were not found to mediate the disease. The paper titled “Assessment of the genetic and clinical determinants of fracture risk: genome wide association and mendelian randomization study” has appeared in the British Medical Journal. This study was made possible through a team of researchers from the U.S., Europe, Canada, Asia and Australia who formed the largest effort to date investigating the genetics of osteoporosis and fracture risk. The study team included researchers from the Institute for Aging Research at Hebrew SeniorLife–among them, co-senior author Douglas P. Kiel, M.D., M.P.H., Director of the Musculoskeletal Research Center. The study sample was comprised of 185,057 cases of bone fractures and 377,201 controls who were part of the Genetic Factors for Osteoporosis (“GEFOS”) Consortium, the UKBiobank Study and the 23andMe biotech company. This first genome-wide association study (GWAS) of fracture risk provides insight into the biologic mechanisms leading to fractures. Most importantly all of the identified genomic regions found to be associated with fracture have also been previously found to be associated with variation in bone mineral density (BMD), one of the most important risk factors for fracture. Based on this finding, the study team performed an additional analysis called “Mendelian Randomization,” that uses genetic information to determine causal relations between risk factors and disease outcomes. The Mendelian Randomization analysis determined that only two examined factors – bone mineral density (BMD) and muscle strength – play a potentially causal role in the risk of suffering osteoporotic fracture. One of the most important findings was that the genetic factors that lead to lowered vitamin D levels do not increase risk of fracture, meaning that vitamin D supplementation is not likely to prevent fractures in the general population. Although vitamin D supplementation is part of clinical guidelines, recent randomized control trials have failed to consistently demonstrate a beneficial effect. According to Dr. Kiel, “Among the clinical risk factors for fracture assessed in the study, only BMD showed a major causal effect on fracture. The genetic factors contributing to fractures are also the same ones that affect BMD. Knowing one’s genetic risk for fracture at an early age could be a useful piece of information to persons wanting to maintain their bone health as they age. The condition leads to bone fragility and an increased risk of fractures, especially of the hip, spine and wrist. About one-quarter of those over age 50 who suffer a hip fracture die within a year of the injury.